Egypt was unanimously elected next year’s chair of the African Union (AU) during the AU summit in Ethiopia’s capital Addis Ababa in January 2018. The AU was created in 2002, following the disbanding of the Organisation of African Unity, counts all 55 African countries as members and holds an annual summit in Ethiopia. Egypt has never before been elected head of the AU. President Abdel-Fattah Al-Sisi, who is due to visit Ethiopia next month, will be chairman of the 31st round of the assembly of the AU, replacing the President of Rwanda Paul Kagame. Ahead of Egypt assuming leadership of the AU, a two-day Africa 2018 Forum was organised in Egypt’s Red Sea resort of Sharm El-Sheikh. Focused on promoting economic growth across the continent, the event closed on Sunday. Egypt, in collaboration with the African Development Bank and the African Export-Import Bank, has also organised an exhibition for inter-African trade. The event, which kicked off on Tuesday and will continue until next Monday, has attracted more than 1,500 participants from some of the largest companies in Africa and the world. Between 13 and 15 December, Egypt is also scheduled to host the seventh conference of African trade ministers. informed reporters that in a meeting on Tuesday with Chileshe Kapwepwe, the Zimbabwean secretary-general of the Common Market for Eastern and Southern Africa (COMESA), President Al-Sisi said Egypt was set on recovering its leading role in Africa and will use its presidency of the AU in 2019 to advocate for the continent economically and politically. Tarek Radwan, head of parliament’s African Affairs Committee, told Al-Ahram Weekly that all state institutions have been mobilised to ensure 2019 becomes a landmark year in terms of Egypt’s foreign policy. “The African Affairs Committee, and parliament as a whole, are closely coordinating with the Foreign Ministry and the government to finalise our strategy in Africa in 2019,” said Radwan. The African Affairs Committee is holding a series of meetings with ambassadors from African countries to set the stage for 2019. “All of them said they welcome Egypt playing a leading role in Africa and revealed that they are under instructions from their governments to do everything possible to facilitate this,” said Radwan. In a meeting with Radwan on 5 December, Djibouti’s Ambassador Mohamed Zohr Harsi revealed his country had decided to grant Egypt one million square metres to establish a logistic base to facilitate continental exports. 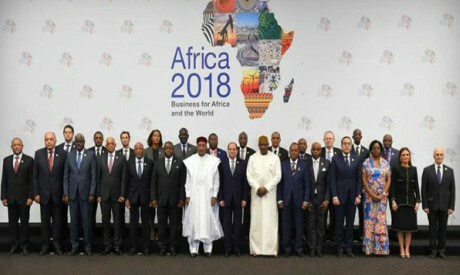 During the closing ceremony of the Africa 2018 (Business for Africa and the World) Forum in Sharm El-Sheikh Sunday, President Al-Sisi announced the creation of an investment fund for IT infrastructure in Africa and a risk insurance fund to promote Egyptian investments across the continent. “Egypt will be back in Africa with all the strength and force required,” said Al-Sisi. Al-Sisi vowed that Egypt will boost its own investments in African countries in 2019. “Egyptian investments in Africa increased by $1.2 billion in 2018 to reach a total of $10.2 billion and are expected to grow even more in 2019,” said Al-Sisi. Radwan says the reaction of African leaders, governments and businesspeople to Egypt’s growing role in Africa was clear during the Africa 2018 Forum Conference. Shoukri insisted Egypt’s relations with Ethiopia are strong. “Negotiations between the two countries have slowed down in recent months, largely due to a cabinet reshuffle in Addis Ababa, but we hope soon to reach common ground on the issue of Nile water and the Renaissance Dam,” said Shoukri. Shoukri said Egypt’s relations with Sudan have also improved. Egypt’s interest in Africa in 2019 will not be confined to economics and business. President Al-Sisi told the Africa 2018 Forum that there is a pressing need for institutional reforms in the AU. “I am proposing AU decision-making passes through different levels within the union for review and auditing before being endorsed by state leaders instead of being the sole prerogative of the assembly,” said Al-Sisi. Informed sources also say Egypt may use its chair of the AU to press for Africa to have a permanent seat on the UN Security Council. Abu Taleb notes that Egypt’s interest in Africa extends to facilitating greater cooperation in military and counter-terrorism matters. This week, for the first time, Egypt hosted military exercises for Sahel-Saharan states at the Mohamed Naguib military base west of Alexandria. The exercises are scheduled to end on 14 December.